Birds come in many different colours, shapes and personalities – but they all make our imaginations soar. This stunning picture book takes a poetic look at all kinds of birds – loud, quiet, big, small – and celebrates their impact on our lives. From the happy songs that greet us every morning to the messages of peace they bear, this colourful picture book invites the reader to appreciate the beautiful birds all around them. 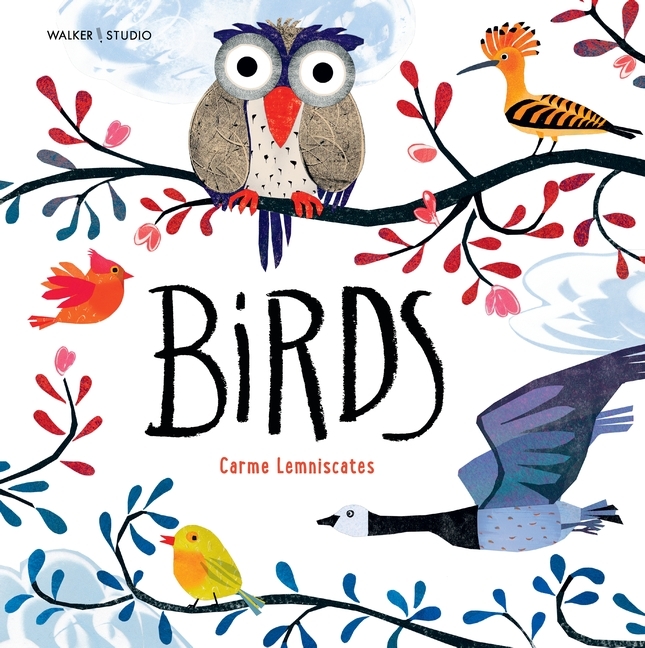 Carme Lemniscates is an award-winning author, illustrator, and designer of children’s books who sees each book project as a complete undertaking in which the text, illustrations, and graphic design converge with the same spirit from beginning to end. Her mixed media works combine monotype, collage, woodcut, and digital media. In 2010 she founded Lemniscates Studio in her home city of Barcelona to create her own children’s book projects, which she both writes and illustrates. She has since published nine books in Spain, the United States, and Brazil. Her book Silence won a 2012 ForeWord Reviews Book of the Year Bronze Award, and her app Little Lost Rabbit Finds a Family was selected as one of the best children’s storybook apps by Kirkus Reviews in 2012. In 2016 she won the Serra d’Or Critics’ Award for Arbres, published in the UK as Trees by Walker Studio.